Southwest Georgia’s Decatur County is gaining tangible momentum as a result of teamwork and shared leadership vision. Heads of city and county departments, along with elected officials, are focused on improving their challenged economy by diversifying offerings. Solar farms, biopolymer production and river barge transportation are part of the plan. County Commission Chair Pete Stephens has spent his whole life in Bainbridge and has seen the county through ups and downs. The son of a farmer, he also farmed in Decatur County until retirement last year. “This is not what I planned for this stage in my life,” laughs Stephens, about his position as a commissioner and his role in creating cohesion among local leadership. “When two mules are pulling in different directions, it doesn’t get the plowing done,” says Stephens, who is encouraged that folks seem to be on the same page, pulling for the same positive outcomes. Supporting the local school system, shoring up the community hospital and growing viable jobs top the list. Stephens estimates 1,200 manufacturing jobs were lost over the past two decades, and the local unemployment rate continues to hover above the state average. This adds urgency to local leaders’ focus on attracting new business and industry. “Those people moved out of the county or went to other jobs and would be willing to go back to work in manufacturing any day,” he says. But manufacturing jobs have been slow to return to Decatur County where, traditionally, about 60 percent of the economy has been agriculture-based followed by building trade-related companies that were hit hard by the Great Recession. Because of those changing trends, the county has sought to diversify and bring in some advanced manufacturing jobs, says Rick McCaskill, executive director of the Development Authority of Bainbridge and Decatur County. “We have created quite a few manufacturing jobs through local expansions but have lost just as much through plant closings. So we’ve netted few new manufacturing jobs in the past few years,” he says, noting that overall unemployment has gone from roughly 11 percent in 2011 to around 6 percent currently. One type of manufacturing tracking with recent trends in sustainability is Danimer Scientific, a producer of biopolymers – sometimes called bioplastics – from renewable biomass sources, including vegetable oil, various plant starches and by-products from trees. Some of Danimer’s bioplastics are biodegradable and can replace everyday uses of petroleum-derived disposable plastics, such as packaging, carryout bags, food service items, toys and most personal and home products. 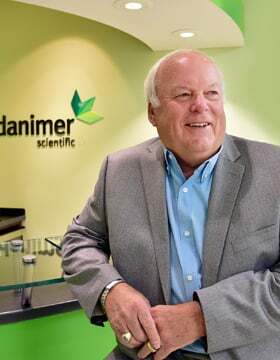 Danimer Scientific has operated in Decatur County since 2004, says Michael Smith, COO, and has expanded a number of times since then. The company currently employs 58 people and operates more than 200,000 square feet of state-of-the-art laboratory and manufacturing/testing space on 135 acres in the industrial park. The company also does research and development from its Decatur County location, as well as in a lab on the University of Georgia campus in Athens. Danimer recently completed back-to-back expansions with investments of $1 million and $6 million, the latter scheduled for completion mid-summer. Together the expansions add another 16 positions. But it was an announcement at the first of March that really has the Danimer Scientific team and community leaders pumped – a partnership with global food and beverage company PepsiCo Inc. to develop biodegradable film resins to meet PepsiCo’s sustainable flexible packaging requirements, says Smith. The project, set for completion in 2020, involves a $100-million-plus investment in another commercial plant for Danimer in Decatur County, adding 30 to 40 jobs. “This is not highly labor dependent by design … we automate everything we can so we have good-paying jobs that will be around for the duration,” says Smith, adding that total employment will be up to 70 teammates by the end of this year and more than 100 by completion of the PepsiCo project. The Decatur County school system, with eight schools and 5,000 students, is under the leadership of Superintendent Tim Cochran, who arrived last fall. He’s in conversation with community partners about the potential creation of the county’s first college and career academy. Cochran says most school systems across the state have been doing some version of a college and career academy since the Technical College System of Georgia’s MOWR and dual enrollment were launched. “It’s putting it in a package that’s a little easier to present,” and creates a little more formality so that if any of the major partners change, the program remains cohesive within the school system, he says. While it’s not at the end of a tunnel, there is another light that has Decatur County scoring big these days – sunlight. The county is currently home to two solar farms totaling about 1,200 acres and is bidding for more. Though there are no long-term positions associated with such ventures, as many as 600 temp workers were hired during construction of the first two. “We’re a good area for it because we’re so far south, and we’re pretty darn flat, so that makes it easy,” says McCaskill, who helps connect solar developers with landowners, who benefit from very lucrative lease rates. One solution might be the shallow-water barge operation used recently by some local manufacturers, such as the one making bridge spans and enormous lock doors for dams. Its only option is to ship by barge. McCaskill says several Decatur County companies along the river, including an asphalt company, would immediately double or triple their workforce if dependable barge traffic opens up year-round. Many businesses that used to depend on the river now depend on rail. Decatur County has a tremendous rail system with a number of spurs and the ability to add spurs, says McCaskill. A rail yard is being added to the shortline railroad, Georgia Southwest, which could dovetail with work being done by Cordele Intermodal Services in nearby Colquitt County. “We’re in the very early stages of putting that together,” he says. Today, Decatur County is leaning on revenue sources that were unheard of not long ago. From solar farms to sustainable plastics, reinventing an economy still trying to shake off the recession is an easier task to accomplish when there’s a united front leading the way. Bainbridge and Decatur County boast a reputation for fine fishing thanks to the waters of the Flint River and those of sprawling Lake Seminole. So it makes perfect sense that some standout anglers would hail from this region, including the most accomplished female bass angler of all time. As an adult, Martin-Wells began fishing competitively. In 2010 she became the first woman to qualify for the Bass Master Classic and make it through to the third and final day, where she finished 22nd out of 51 – the only female in the tournament – in a sport where women aren’t always welcomed with open arms. Her biggest tournament total was at a two-day Bassin’ Gal event in the ’90s on Sam Rayburn Lake in Texas, where she finished with 42 pounds and some ounces, including an 11-pounder, she says. Today she’s supported by a number of big sponsors, including the Bainbridge Convention & Visitors Bureau, whose ad wraps Martin-Wells’ boat, a Legend V20. Additional sponsors include Legend Boats, Mercury Marine, Castaway Rods, Lowrance Electronics, Power Pole and Alabama author Linda Howard. The support allows her to fish the “season,” roughly February through October, including team fishing the Alabama Bass Trail with her husband, Steven, and in the Lady Bass Anglers Association.